As a mom to three children under six I have not slept well in years. I think we all know as moms that once a baby arrives sleep changes drastically. Sleeping will probably never be quite the same, but I am happy to say that my youngest is now two and I am starting to slowly get normal nightly sleep again. In my last home, which we lived in until she was one and a half, my youngest was in my bedroom due to not having a room of her own. With a baby crib and all of her supplies, it wasn’t exactly an adult space. Which was okay with me, I loved having her there, but it has been a long time since my room was my tranquil space . We moved into a new home last spring and she finally has her own bedroom. With this move I made it a goal to get my baby sleeping through the night, and to transform my bedroom into my adult space and sanctuary. The transformation is going well. I have taken steps to create a peaceful sleep environment, and my youngest is sleeping pretty well most nights too. My only remaining issue is a snoring spouse but I have my Bose® noise-masking sleepbuds™ helping me out with this. 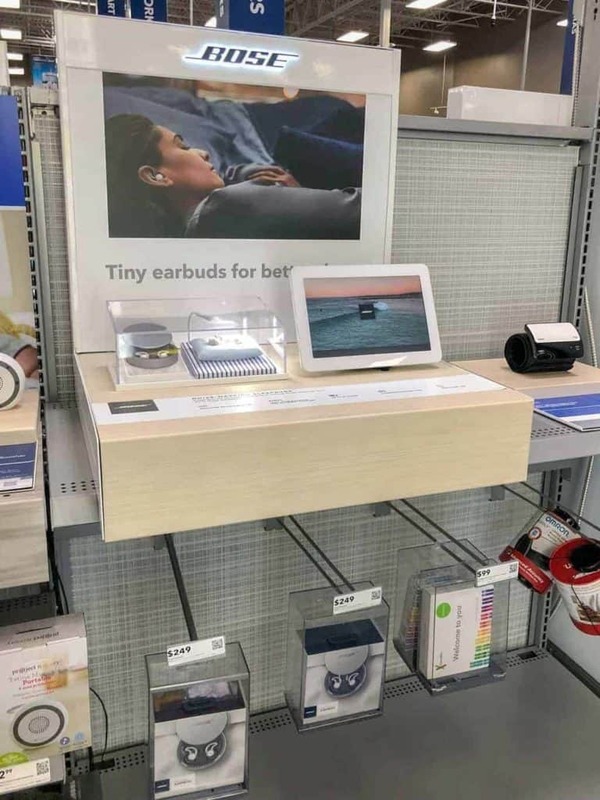 Click on the image to purchase the item online at Best Buy. One of the first items I needed for my new room were new sheets and decor. 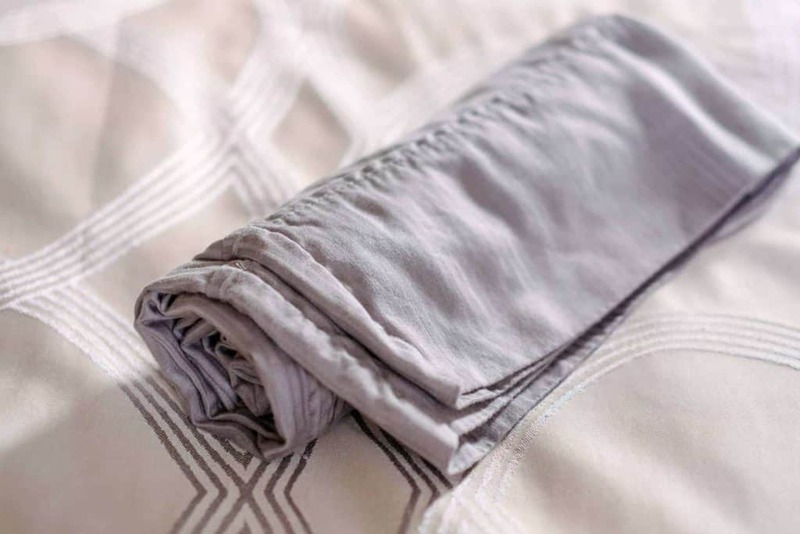 I have purchased some natural fiber and breathable sheets and I love them. The next item I add is a small memory foam pillow. I use this to support my back or legs, or wherever I am sore while sleeping. 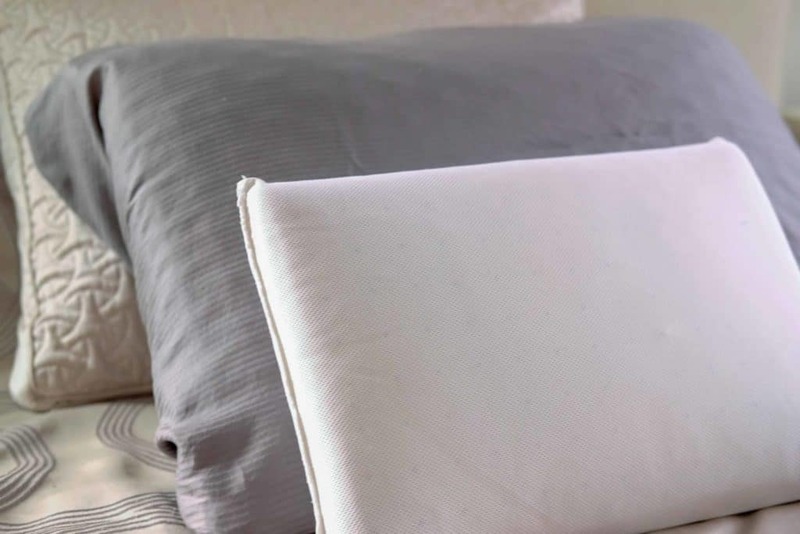 After three babies I have all kinds of aches and pains, and find these small pillows helpful. I keep my bedroom decorations and colors neutral. I don’t think bright colors would help me sleep well. Since our house is new we have not painted yet but we plan to go with a color called Sea Salt and it looks exactly like you imagine. In the meantime, everything is varying shades of white, off white, and grey with a little teal thrown in. Neutral colors are great for keeping everything feeling calm. I love to have a fan wherever I sleep. I can’t stand getting warm while sleeping. 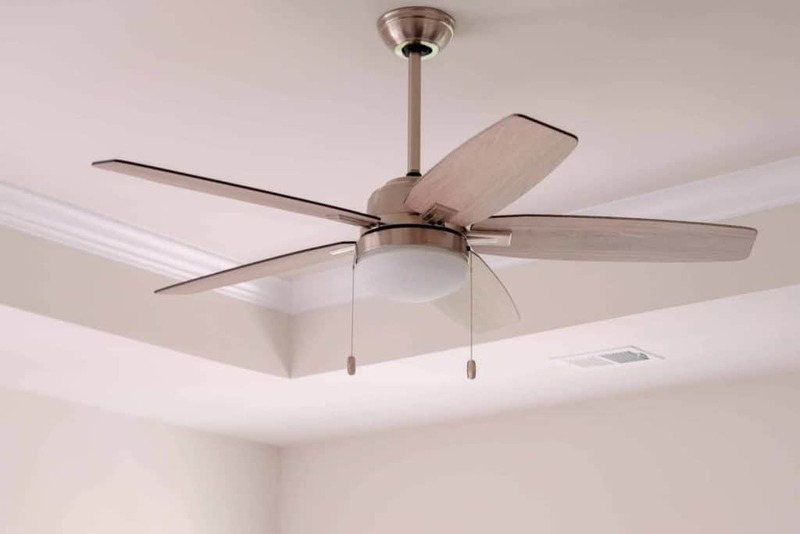 A ceiling fan works best for us and we installed one as soon as we moved in. 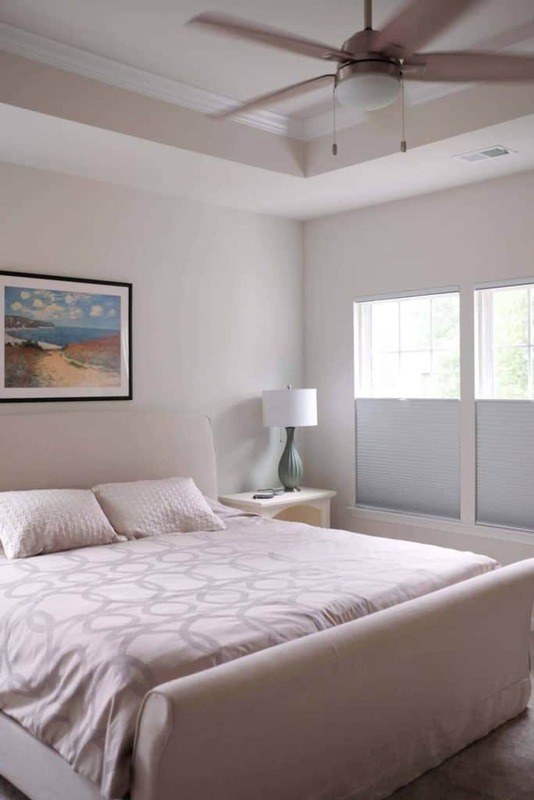 Another must have for restful sleep is black out blinds, curtains, or shades. 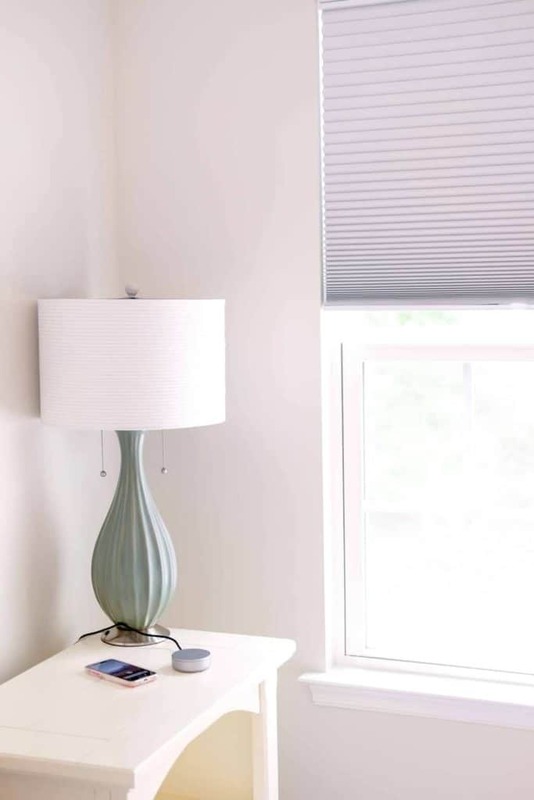 I have used all of these in the past, but my absolute favorite which blocks out all of the light is blackout cellular shades. 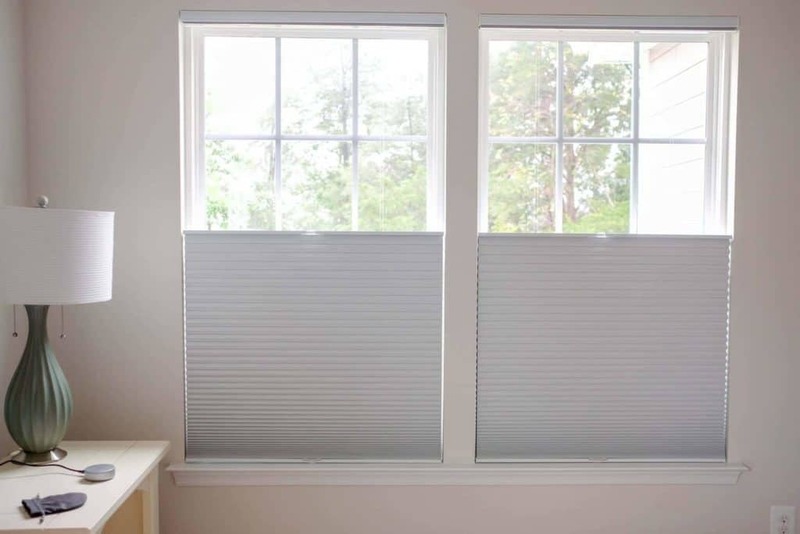 I have these shades all over the house and I love their versatility. I definitely go for the blackout in our bedroom and it works so well. We have the kind which pull up from the top or bottom, so we can let light in and maintain privacy by pulling from the top down. Find a way to sleep through external noise including a snoring spouse. The last step to restful sleep is making sure loud snoring does not wake me up. This has been an issue on and off through our marriage and my spouse says I snore sometimes too. This is where the Bose® noise-masking sleepbuds™ come in. I found them at Best Buy and you can also get them at BestBuy.com. While the sleepbuds™ do not cancel noise completely and they do not stream music, they do block out and mask noise making it easy to get the rest I need. They play a variety of soothing sounds that help me fall asleep. 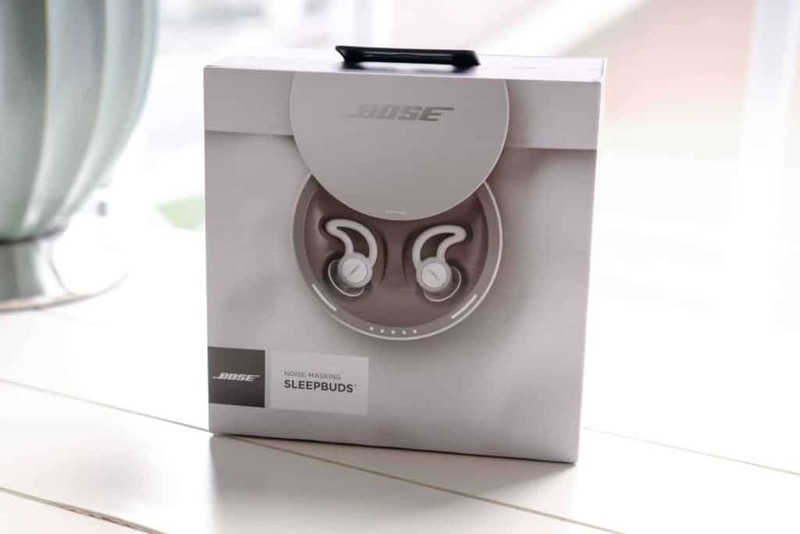 With the The Bose® Sleep app you quickly pair the sleepbuds™ and start listening to all of the soothing sounds. I found the set up quick and simple. 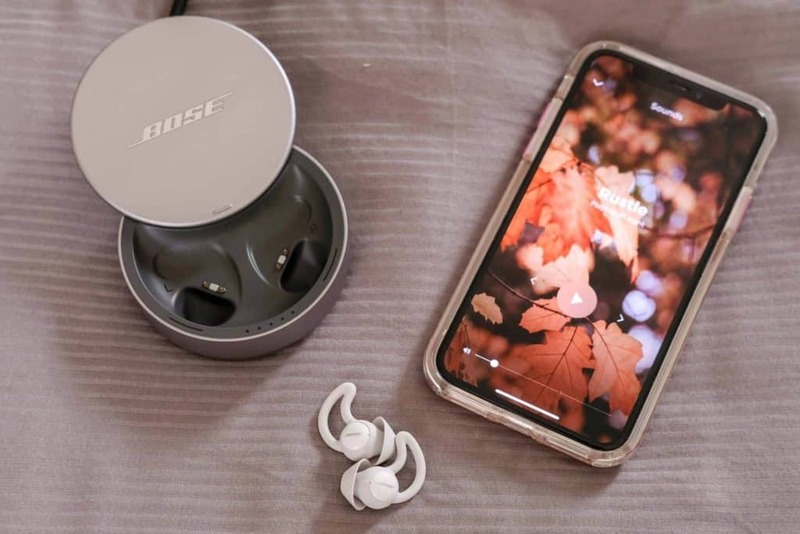 A helpful feature of the sleepbuds™ is setting an alarm via the The Bose® Sleep app to wake me up. The alarm is only heard by me and will not wake my husband up. There is also an option in the app to only play the sleep sounds for a specific amount of time. This is great if I do not want them playing all night. The app will offer software updates in the future so there may be more sounds to come or other features. The sleepbuds™ are extremely comfortable and I had no issue with them coming out whether sleeping on my side, or any other position. They come with three sizes as well so it’s easy to get a good fit. I found these much more comfortable than regular old ear plugs which always bug me and never really helped block out the snoring. The sleepbuds™ include a sleek and small rechargeable case and rechargeable batteries within them. The silver-zinc micro batters provide up to 16 hours of use from one charge. The sleepbuds™ then can be charged via the combination charger and case even if it is not plugged in. As far as safety goes these batteries are the same technology used in other wearable devices such as hearing aids. They are completely safe to use. Since I do have small children and I want to make sure I can still hear them while wearing these, I can keep them turned down pretty low and still get restful sleep. Of course, I also have my husband listening out too. We never wear these at the same time so somebody is always listening. 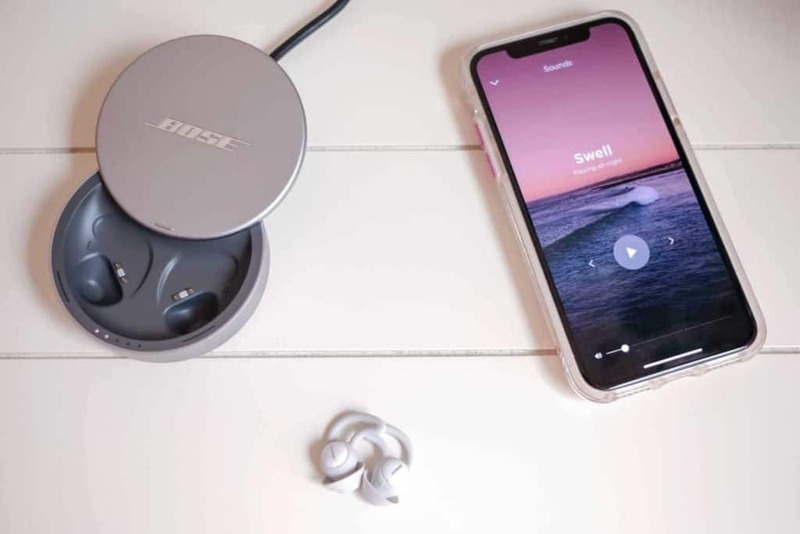 You can find these amazing Bose® noise-masking sleepbuds™ at Best Buy and BestBuy.com. These are my tips for creating a tranquil and peaceful sleep environment. I have spent many years getting subpar sleep, between the years spent taking care of babies and small children, to snoring spouses there are so many disruptions in our lives preventing quality sleep. While there is still more to do to get my room perfect, it is well on its way. Do you have trouble sleeping? Please let me know in the comments if you have any sleep challenges. Update to the Sleepbuds app! On Wednesday 10/31, there was a software update to the Sleepbuds app. This release introduces a significant new feature to the “Sound Library”. 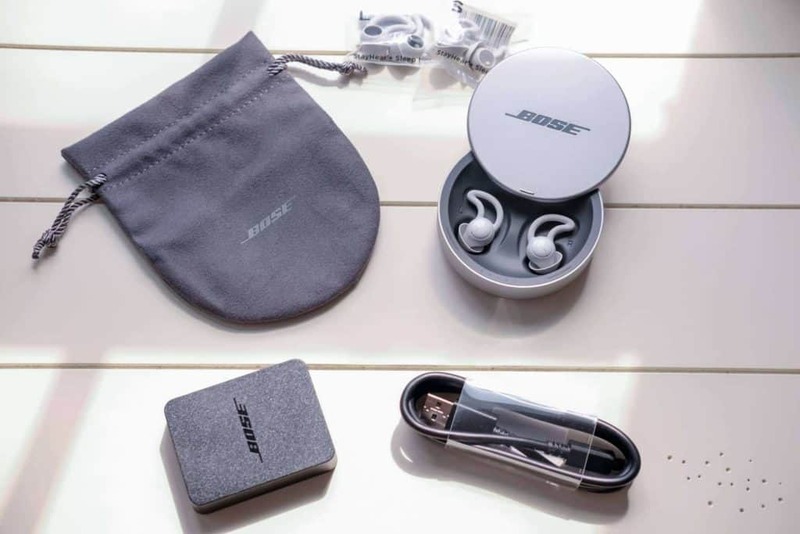 The Sound Library will include 10 new sounds and will enable consumers to swap Bose-supplies sound between the Library and their Sleepbuds. Those with sleepbuds will receive a message to update the app to receive the updates.